Annie Cattrell and Mark Lythgoe - thoughts into sculpture. 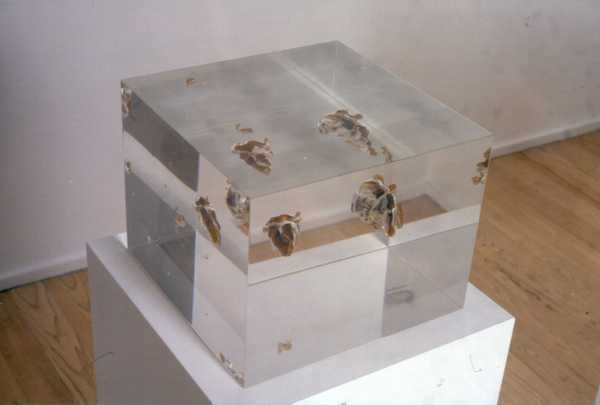 Their collaboration has resulted in two pieces called 'Seeing' and 'Hearing', being displayed as part of the Head On exhibition in the Wellcome wing of the Science Museum, as well as other exhibitions. This sequence of sculptures illustrates the activity patterns of the human brain as it responds to the five senses: touch, smell, sight, hearing and taste. Scans of a subject's brain using each of the senses were produced with functional magnetic resonance imaging. These scans were then converted into three-dimensional physical structures of amber resin using a rapid-prototyping process. The elegant simplicity of the sculptures belies the complexity of the technology required to make them.